Now we don't need another article about the importance of links in the determination of a site's ranking. We all know it and tend to be rather short sighted about adding only those links that will add to your site's SEO performance and page ranking. However, when you look at the world of SEO, it's only natural to find ways in which we can boost our performance in the most cost effective and efficient way. We all know that "Follow" links are worth a lot. Have enough of them from the right sites, and boom… It is page one and all the rewards that come from it. But back in 2005 when Google changed the blogging world and introduced the "NoFollow" link designation, everything seemed to change. Well for most, but not for those who truly understand what building a credible site is all about. So you have posted a link on a site and maybe its automatic policy is for it to be classified as "NoFollow". You would automatic think that you have wasted your time, energy and effort. But what you're forgetting is actually what the whole foundation of blogging and the internet is based upon; the concept that intriguing and interesting content can be followed by a real person, via a link and not just a Google Webcrawler. You may have overlooked that behind Google, Facebook and the millions of blogs are real people looking to be inspired by words and ideas, and if those words and ideas that you have posted also include a link to your site, that can lead to these people being additionally inspired by your website. 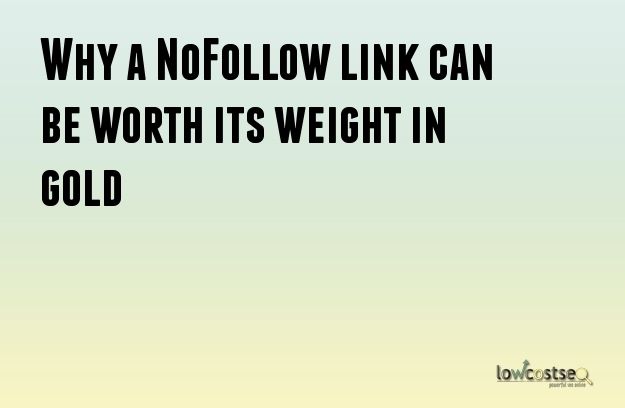 I would therefore venture to say that this supposedly worthless "NoFollow" link can be of major benefit to you and your site. Great content is great content, irrespective of where it is on a site or how it’s designated. If that content forms part of a comment post from an interesting article that has been read by thousands, then there is mass engagement and for whatever reason, your comment is the one that seems to galvanize the group’s sentiment, that in my opinion, you have hit GOLD. And also have to realize that the site you are posting comments on NEEDS people like you to put those credible comments on it as it reflects well on them. You should not ignore the fact that relationships in this business can also start from the ‘Forums and Comments’ section. And relationships are what build credibility and authority over time. This indirectly is what link building is all about, from a purely human perspective. Your ultimate aim of course is to gain as many credible "Follow" links as possible to your site, but don't be dissuaded by having a small, select portfolio of “NoFollow links”. Indirectly, they could take you to page one without you realizing it!